The Ju 290 V1 commenced flight-testing at Dessau on 16 July 1942 with Junkers test pilot Flugkapitän Hans-Joachim Pancherz at the controls along with flight engineer, Diplom-Ingenieur Rolf Geyling. Like the Ju 90, it was one of the largest land aircraft in the German inventory (the Blohm & Voss BV 222 flying boat was larger), its fuselage marginally longer than the Messerschmitt Me 323 six-engined transport and its span almost 10 m greater than the four-engined Focke-Wulf Fw 200 Condor. It had a very roomy cockpit and a cavernous freight area, and although a ventral gondola was fitted, the forward dorsal turret was omitted and the aircraft carried no defensive armament. Internally, the copious, metal-walled stowage area measured 16.3 m in length and was 2.75 m wide and 2 m high. Diplom-Ingenieur Kraft maintained overall control of the development programme, and within three months of the V1 flying, the Ju 290 V3 Wk-Nr 290110152 SB+QB was rolled out, Pancherz piloting it on its inaugural flight on 16 October; the V2 Wk-Nr 290110151 CE+YZ followed on 2 December. This latter aircraft had been converted from the Ju 90 V13, which had been slated for civil use by DLH; indeed, as late as 16 September 1942, German production plans still showed the aircraft as a ‘model for DLH use’. Meanwhile, the V1 concluded its flight-testing without any major problems on 22 November, and shortly thereafter the aircraft was flown to Lecce in southern Italy by Junkers works pilots Flugkapitäne Eduard Dautzenberg and Walter Hänig, along with Geyling, for operational trials in the Mediterranean environment. This was most probably in timely recognition of the fact that large-capacity transport was becoming an urgent requirement in the North African theatre. Although the prototypes were manufactured at Dessau, Junkers decided that ensuing series production would be transferred to its Bernburg plant, where assembly facilities had been steadily developed. Meanwhile, the V2 and V3 served to become the first machines in the new A-1 transporter series, powered by 1,600 hp BMW 801L radial engines. Within the first three months of 1943 four more Ju 290A-1s were produced, representing the entire sub-series, the first machine being built from the V4, the remaining three as newly built A-1s. Again all the airframes (with the exception of one, which was assigned to destruction testing at the Letov factory at Letnany in occupied Czechoslovakia) were test-flown without any major problems by Pancherz. These aircraft were assigned, officially at least, a crew of eight and were fitted with an HDL (Hydraulische Drehringlafette – hydraulically operated gun mount) 151 gun turret (15 mm MG 151 cannon) in the B1 Stand (forward dorsal), a single MG 151 mounted into the ventral gondola C1 Stand (forward ventral) and C2 Stand (aft ventral), and a further MG 151 at the H Stand (tail). A single such weapon could also be installed on FDL (Ferngerichtete Drehringlafetten – remotely controlled mounts) on each side of the fuselage. My first flight in this precious ‘ship’ was in the Ju 290 CE+YZ [an A-1 from the second prototype]. Later, I flew the Ju 290s SB+QG [an A-2] and SB+QB. Although I had already flown the larger Messerschmitt Me 323, the giant powered cargo glider with six Gnome-Rhône engines, the Ju 290 was a ‘real’ aeroplane. And, considering its large size, it was exceptionally pleasant to fly. I remember well a particularly interesting flight in a Ju 290 when we had to evaluate the FuG 101 precision radio altimeter. At long last there was a task that made a pilot’s heart beat faster! Just imagine: officially permitted low-level flying with such a huge ‘steamer’! It was simply fascinating. As it was impossible to do this over land, even over the largest fields, I flew the required measuring run over Lake Müritz. Of course, one had to be terribly careful because the pilot’s seat was fairly high up in the Ju 290 cockpit and it would not have been the first time that someone had tickled the waves with the propeller tips. But I really enjoyed this low-level flight. Later on I also had the opportunity to ferry a newly completed Junkers Ju 290 from the factory at Dessau to Rechlin. It really was a giant piece of hardware with its 42 m span and enormous fuselage. On overland flights I could really enjoy the excellent view from the Ju 290 cockpit. Despite its size the aircraft was pleasant to fly, but on landing one always had to remember that the height of the pilot’s eye level on touching down was more than 6 m above the ground. 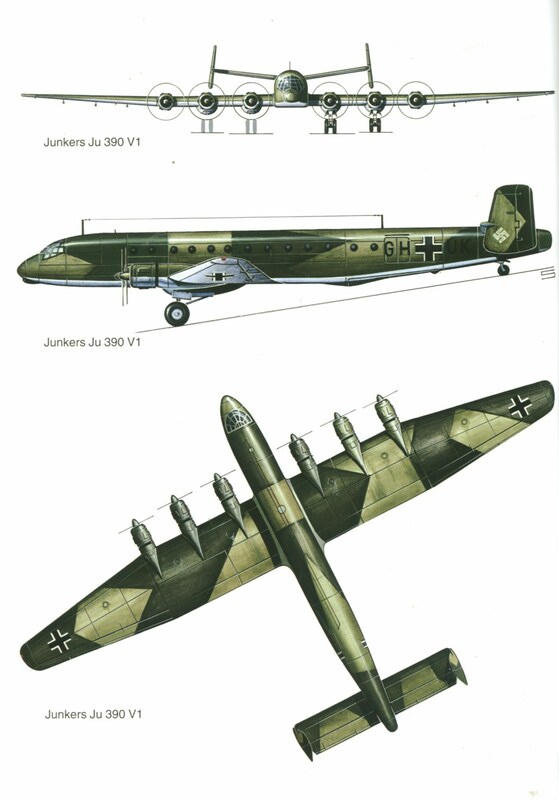 The qualities and performance of the Ju 290 transport, reconnaissance and bomber variants exceeded those of the Focke-Wulf Fw 200 Condor quite considerably, especially as regards armament and maximum range – which, in the case of the Ju 290, was some 6000 km. The Ju 290 first saw operational service under some of the most demanding conditions imaginable – especially for a still largely untried aircraft. At the end of December 1942, along with a Staffel of Ju 90s and some Fw 200s from I. and IV./KG 40, the Ju 290 V1 and A-1s were assigned to take part in the attempt to keep the German 6.Armee – surrounded by Soviet forces amidst the frozen ruins of Stalingrad – supplied by air. The aircraft were allocated to the mixed-type heavy transport Gruppe, KGr.z.b.V.200, based at Berlin-Staaken under the command of Major Hans-Jürgen Willers, a very experienced pilot who had previously flown He 111s with KG 4, KG 54 and KG 40. The first two Ju 290s to depart for Russia were the V1 BD+TX and the A-1 Wk-Nr 290110152 SB+QB. Following an interim stop at Wiener-Neustadt, the V1 landed at Stalino on 28 December. It made its first run to Pitomnik airfield, inside the Stalingrad pocket, in dense fog and with a strong risk of icing, on 10 January. But the mission was without incident. For its part, Wk-Nr 0152 suffered engine problems and was forced to return to Dessau, from where it took off once again on 6 January, staging via Warsaw, Kiev and Poltava, reaching Stalino at 1023 hrs on the 12th. However, as Flugkapitän Walter Hänig attempted to take off from Pitomnik on the return from his second supply flight in the early hours of 13 January, the Ju 290 V1 crashed. Hänig, along with his Junkers flight engineer, Flieger-Oberingenieur Robert Stiefel, and three of his Luftwaffe crew members, together with 40 of the 75 wounded Wehrmacht troops on board, were killed. It was a grim beginning for the Ju 290. Despite their valuable load capacities, and the obvious advantages of the Trapoklappe loading system over the more makeshift capabilities of the Fw 200, the big aircraft proved an easy target for Soviet fighters. Wk-Nr 0152’s flight to the pocket on the 13th would be its only one. The aircraft was piloted by the very experienced Major Hugo Wiskandt, who had joined Junkers in 1925, but who served later as Staffelkapitän of 1./KGr.z.b.V.172. He was accompanied by Flugkapitän Hesselbach as co-pilot and navigator, and Diplom-Ingenieur Geyling. The aircraft took off from Stalino in refreshingly clear winter skies, en route for Pitomnik, accompanied by an Fw 200. But a short while into their flight the German aircraft were attacked by a formation of five Soviet fighters. The Ju 290A-1 received multiple hits, but was able to make it to Pitomnik, where an inspection revealed that the aircraft’s fuel feed system had been damaged. After some hasty and temporary repairs, the aircraft took off again to return to Stalino, but with a restricted load of only some ten badly wounded soldiers. At Stalino, a full count showed that the Junkers had been hit no fewer than 123 times. Under such circumstances, no further operations were considered possible, and so on 17 January, it undertook a 5½-hour direct flight back to Rangsdorf in Germany. From there it flew to Tempelhof for major repair work, and not long afterwards it would be assigned another, equally dangerous task. The Ju 290A-1 returned to the Eastern Front, where it remained until early February 1943, but worsening conditions on the ground combined with the appalling sub-zero conditions meant that it became all but impossible to continue making any meaningful flights. Eventually, Stalingrad and 6.Armee were lost, with 91,000 survivors passing into Soviet captivity. By the spring of 1943, the Axis war effort in North Africa had become increasingly precarious. During the final months of the previous year, the Germans had pulled back towards Tunisia pursued by the British Eighth Army, and the Allies had landed in North-West Africa in Operation Torch, opening up a second front. It was therefore decided to establish a bridgehead at Tunis. The Luftwaffe was at full stretch assisting Rommel in attacking the enemy invasion front and convoys off the North-West African coast and ports, in engaging the enemy air forces in the Algiers area and in maintaining and protecting the air routes between Italy, Sicily, Tripoli and Gabes/Tunis along which transports flew. Transport missions were flown daily to the Tunis bridgehead, flying in replacement troops, aviation fuel, air-to-ground and Flak ordnance, anti-tank munitions and general supplies, while on the return flights Ju 52/3ms and a handful of Me 323s airlifted out wounded personnel and empty fuel drums. Then in late December 1942, several of the Mediterranean-based transport Gruppen were ordered to relocate urgently to Russia to assist with the crisis at Stalingrad, leaving a force of 200 Ju 52/3ms to maintain supply flights to German forces in Tunisia, along with 15 Me 323s and a force of Regia Aeronautica SM.81s and SM.82s. On 18 January 1943, however, the Luftwaffe suffered a blow at Tunis when no fewer than 23 Ju 52/3ms were destroyed on the ground during an Allied air raid. Tripoli was taken by Montgomery five days later. From February 1943 onwards, it was no longer a question of stemming the tide, but how long the inevitable could be held off. Yet the transports continued to fly determinedly despite increasing numbers of Allied fighters. Rommel left North Africa in early March, never to return, and in May the two armies comprising Heeresgruppe Afrika under Generaloberst Hans-Jürgen von Arnim disintegrated into isolated pools of resistance. In order to shore up the Luftwaffe transport effort, at least two Ju 290A-1s – Wk-Nr 290110152 SB+QB, which had been repaired after suffering the aforementioned heavy damage during the Stalingrad airlift, and the newly delivered Wk-Nr 290110154 SB+QD – were handed over to Lufttransportstaffel (LTS) 290. LTS 290 had been established at Tempelhof in January 1943 as a specialist four-engined transport unit, which operated under the direct control of the OKL. Known initially as the Transporterstaffel Berlin-Tempelhof under Hauptmann d.R. Hans Haumann, who had previously flown Ju52/3ms with KGr.z.b.V.107, command was passed after only a short time to Hauptmann Heinz Braun, a former Fw 200 pilot with 7./KG 40 who had suffered wounds while attacking enemy shipping in the Atlantic in 1940. 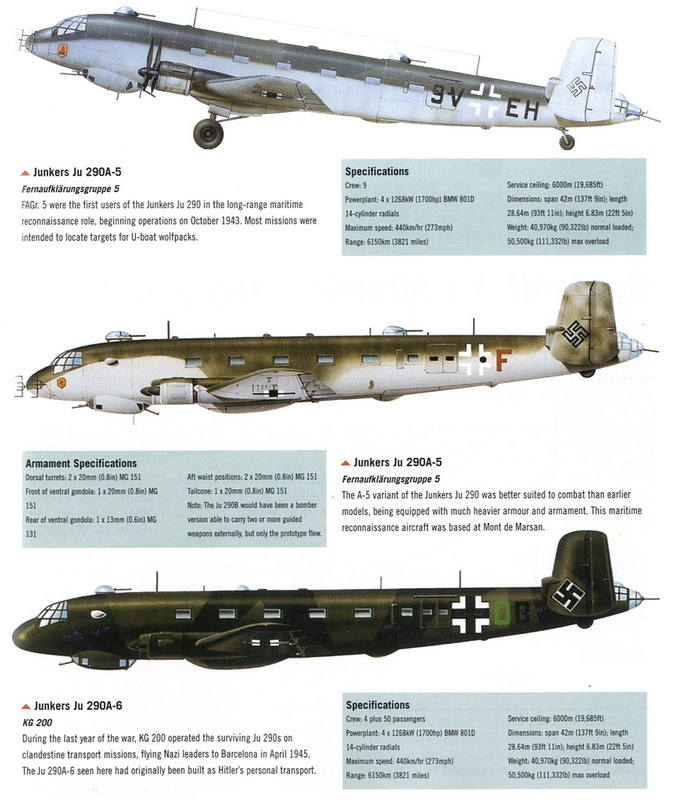 The Staffel also numbered most of the available Ju 90s, the Ju 252 V5 and an unarmed Fw 200, as well as an armed C-5, and a small number of Italian Piaggio P.108 bombers. It would deploy its aircraft from Grosseto, some 150 km north of Rome on the Italian west coast, on transport missions to supply German forces in North Africa. The Ju 290s, with their comparatively vast payloads, may have been a welcome sight to the men of Heeresgruppe Afrika, but their abilities were severely put to the test. Conditions in Tunisia were far from ideal: large aircraft such as the Ju 290 could really only be effective in conditions of air supremacy, with adequately prepared landing grounds and local military stability, none of which was the case in the Tunis area. On 7 April 1943, the Ju 290 Wk-Nr 0152, piloted once more by Major Wiskandt, suffered 50 per cent damage when it crash-landed at Megrine, just outside Tunis, and the aircraft was subsequently abandoned. Three weeks later on 1 May, Ju 290A-1 Wk-Nr 0154, re-coded as J4+AH and flown by Hauptmann Kurt Vogel, endured similar damage at Sidi Ahmed, south-west of Bizerta, and was also abandoned; it had been delivered by Junkers only in February. 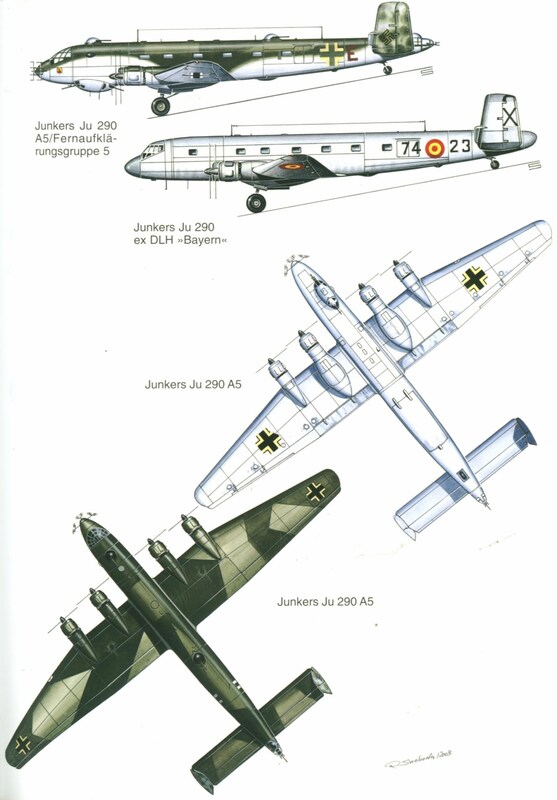 Simultaneous to the Ju 290’s deployment to Russia and North Africa was the request in the spring of 1943 from Oberst Karl-Henning von Barsewisch, the General der Aufklärungsflieger, for 12 Ju 290s to be built as long-range reconnaissance machines. However, this idea was quashed by the Technisches Amt in March 1943 on the basis that at that stage of the war, what was more urgently needed was fighters, particularly Fw 190s, to defend the skies over the Reich and the occupied territories, and to deal with the increasing threat from the Allied strategic air forces in the West as well as the ever-strengthening Soviet Air Forces in the East. Furthermore, it was the view of those in the Technical Office that a suggestion to increase the number of Ju 290s in 1944 from 86 machines to 174 could be carried out only at the expense of Fw 190 production. Even a proposal to convert four Ju 290 transports as reconnaissance aircraft was rejected. However, in effect, the Ju 290 owed its survival to Grossadmiral Dönitz. As the Befehlshaber der Unterseeboote, Hitler favoured Dönitz and trusted his judgement, and, with enemy convoys in the Atlantic now operating beyond the range of the Fw 200, Dönitz had made a strong case to the Führer for the urgent need for increased longer-range air reconnaissance to contribute to the steadily worsening state of the U-boat war. As Ju 290 historians Karl Kössler and Günther Ott note, this ‘obviously had its effect’. The decision to halt further work on the Ju 290 was reversed. Hans-Joachim Pancherz undertook the first flights in the three Ju 290 A-2s, coded SB+QG (0157), SB+QH (0158) and SB+QI (0159), in May and June 1943. Powered by BMW 801Ls, the aircraft were fitted with additional radio equipment and FuG 200 Hohentwiel air-to-surface vessel search radar for sea reconnaissance work, with extra armament in the form of a second, electric-hydraullically operated HDL 151 dorsal turret. The ensuing five-aircraft Ju 290A-3 series, all test-flown by Eduard Dautzenberg, was similar to the A-2, but was installed with more powerful 1,700 hp BMW 801Ds together with a Focke-Wulf Fw 20 reduced-drag, lower-profile aft dorsal gun turret and improved gondola design. Additionally, both the A-2 and A-3 carried a single MG 151 in the tail operated by a prone gunner, accessible from inside the fuselage. This ‘tail’ turret had a traverse of 60°, with an elevation of 45° above and 60° below the horizontal. In the case of the A-3, provision was made to mount manually operated MG 131s in left and right waist positions, which could be easily removed and stowed in the fuselage when not in use. The A-3 also featured additional armour for the pilots’ area, weapons stands and engines, and carried FuG 10 and FuG 16Z VHF transceivers, FuG 200 radar, and a rubber dinghy contained in purpose-built fuselage accommodation. As far as Dönitz and the Kriegsmarine were concerned, these aircraft were needed out in the Atlantic and could not come quickly enough. With progress now under way, the next requirement was for experienced and capable crews to fly them. This entry was posted in Air Warfare, Aircraft, Germany by MSW. Bookmark the permalink. This article as well as others posted are simply excellent.